We have spoken on more than one occasion of the false myths about the batteries of mobile phones, but this time we have set out to delve into a more specific question: is it bad to leave the phone charging all night? Is it Bad to Leave Charging the Mobile During the Night? Misunderstandings on this subject have proliferated despite the resounding – and repeated – responses of the experts. On the Internet you can find many web pages where this issue is addressed and resolved in a clear way: NO, it is not bad to leave the phone charging all night. However, the myth about batteries still persists because many users are reluctant to accept that these components are not ruined from one day to the next. That this issue is still in vogue shows that users concern about the mobile’s battery life is completely real. And no wonder, they are a fundamental part of any device and its capacity seems to be a decade behind other advanced technology. But it is not that they have not evolved; the FullHD panels, the GB of RAM, the latest generation processors, etc consume more energy than ever. Why do we fear the “memory effect “? Nickel-cadmium batteries are quite common in domestic and industrial use, but they are used less and less because of the memory effect and their polluting potential. Of all the types of batteries, those of lithium ions and those of lithium polymers – which are used in mobile devices – are those that present a lower coefficient of memory effect. In fact, until a study was published in the journal Nature, it was believed that, directly, they did not have this weak point. It is fair to mention that the memory effect of lithium-ion batteries is practically imperceptible to the user. The actual life of smartphones is less than the time it would take us to notice the natural degradation of the battery. However, there are more factors that must be taken into account when answering the question that concerns us. It is true that smart smartphones integrate a system that interrupts the entry of electricity once it is detected that the battery is complete. This, for practical purposes, means that we are pending to disconnect the cable just when the battery level reaches 100%. That the battery is completely discharged, however, it is a reason to worry. It is hard to imagine that a smartphone that is turned off, unplugged and with an exhausted battery can explode, however, it is like that. The batteries incorporate a system that makes them totally useless – and forever – when the load level is very low. This prevents them from becoming unstable and critical failures. If this system does not exist, empty batteries could even explode or catch fire. There are many factors that come into play when assessing the useful life of the battery and keeping it plugged into the power all the night is not the most relevant. For example, charging the phone with a case may cause the smartphone to warm up and increase the temperature of the handset. The heat itself is a risk factor to consider. Now, there are reasons beyond the batteries themselves to avoid having the phone plugged in all night. Any device connected to the electric current can suffer from a simple fault or overload in the transformer. It is advisable to avoid having to charge the smartphone many hours in a row for a matter of caution, but lithium-ion batteries could support it without degrading. The good news is that leaving the phone charging all night does not negatively affect the autonomy of our smartphone. It is likely that other components of the mobile will deteriorate or become obsolete long before the battery stops performing properly. I hope this article will clear your all-time mystery question. If you have any queries regarding this topic, start the discussion in the below comment section. Would you like to add any other important points to this story? Then write them to us in the below comment section. We will include them in this article in the next update once the verification is done. 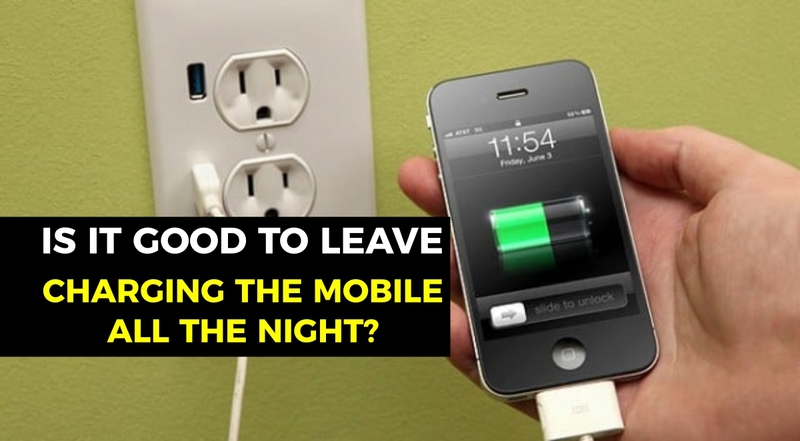 What do you think of leaving charing mobile all the night? Did you see any differences with your mobile?